This weekend, you have the last chance to get the gift for your book-loving significant other. 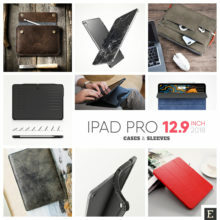 In this overview, we’ve put together the best gifts and deals from around the web. This Saturday and Sunday, many online stores reveal special offers addressed to those who are interested in Valentine’s Day gifts. 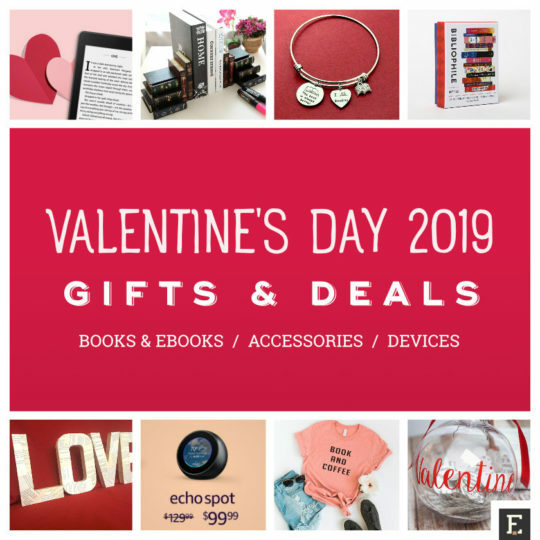 Amazon highlights the most interested deals and gifts in a special Valentine’s Day 2019 Gift Shop. You can find here gift ideas in several categories, including gifts for him, gifts for her, flowers, jewelry, chocolates & candy, or gifts under $30. As usual, we go through these unlimited deals and featured items to pick up the ones that are perfect for people who are addicted to books. This overview is developing. 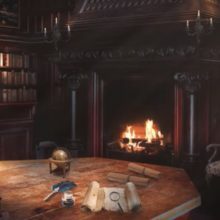 Make sure to come back to see the updated list. It refers especially to Valentine’s Day 2019 deals. New ones are being revealed all the time. Does your significant other love reading? Take a look at the list of the best Valentine's Day gift ideas for her and him. Bracelets, necklaces, mugs, scarfs, rings, and more. In most cases, beautiful flowers or a box of chocolates are more than enough to express love and strengthen bonds. The question is whether the gift could be more creative and more personalized. Below, you will find our gift recommendations. “The best way to a bibliophile’s heart is through a big pile of books .” From Jane Mount comes a beautiful set of bookish notecards and envelopes. This colorfully illustrated set includes 20 cards – each one with a different design featuring book spines of popular books. Themes range from world’s favorite novels to most sought-after cookbooks. LOVE handmade letters are covered with pages from recycled books and measure 8 inches. They are stable and lightweight. These letters are a great decor not only for Valentine’s Day, but also weddings or birthdays. Gift message is available. Story Book Cafe Gifts offers on Etsy gorgeous literary packages that are perfect, ready-to-give gifts for book lovers. There are several boxes to choose from . Each box of bookish treats includes self care essentials that encourage you to rest, relax and recharge so you can carry of being your glorious self. 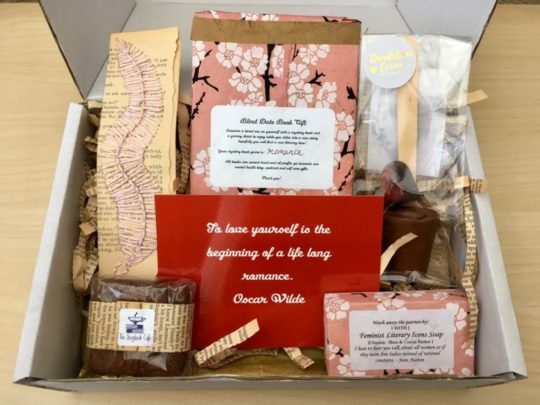 The romance-themed package includes: Oscar Wilde quote postcard, Jane Austen shea & cocoa handmade soap, ginger chocolate brownie, Belgian milk chocolate, and hand-embroidered bookmark. Are you looking for a piece of literary jewelry? Your book-loving significant other will love these bracelets from Gemini Vintage. 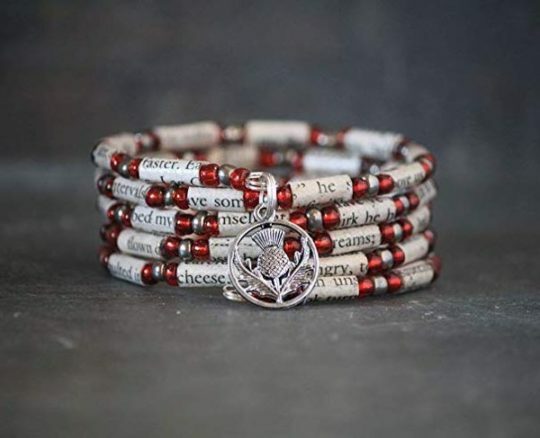 Each bracelet is created from the pages of a novel, covered with polyacrylic for protection, and strung with alternating glass and gunmetal beads in different colors. The bracelets are completed with a metal alloy Scottish thistle charm. Available in three sizes: 8, 9, and 10-inch. 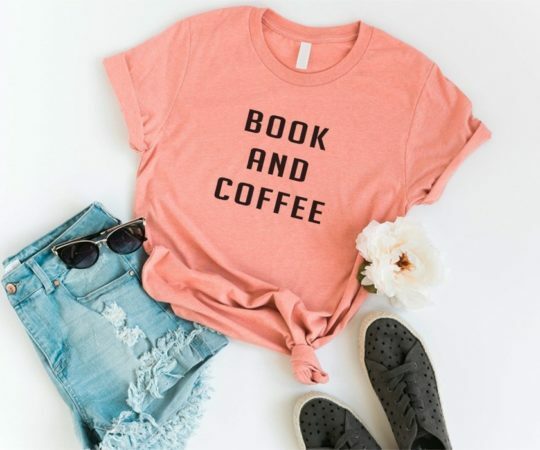 From Cozy Gal comes a cute streetwear t-shirt every bookworm will love to wear. This women’s short-sleeve tee is available in sizes from S to XL, and you can select one of six colors, including Peach seen above. If you are looking for book-inspired home decor, to make the place you life together closer to perfection, take a look at this insanely beautiful vintage paper bouquet. 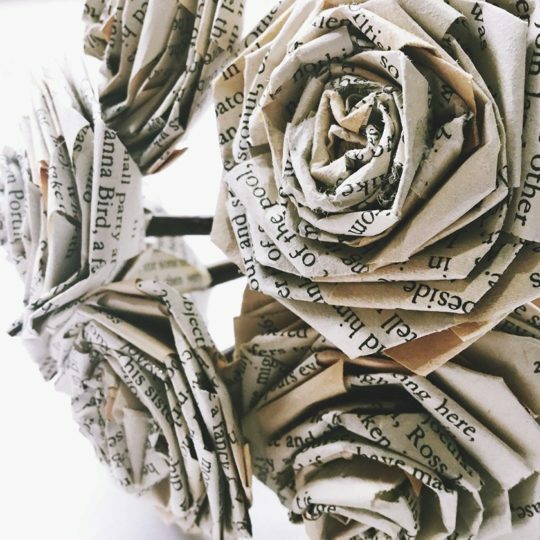 Handmade in the UK from old and damaged copies of English-language novels, the bouquet includes 5 or 6 beautifully formed paper roses – a perfect home decor for a birthday or Valentine’s Day. Each rose head measures about the same as natural rose. You can also use it as a wedding bouquet or boutonniere. 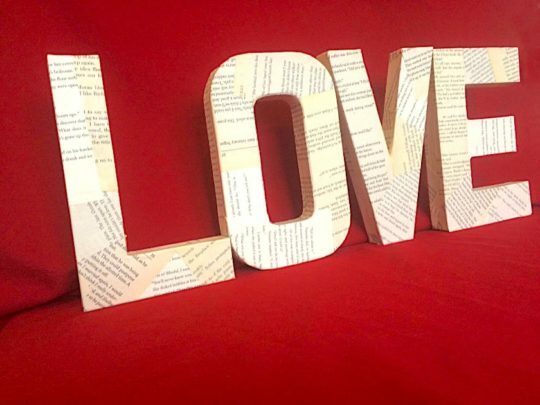 Literally, the perfect literary Valentine’s Day gift for a book lover in your life. 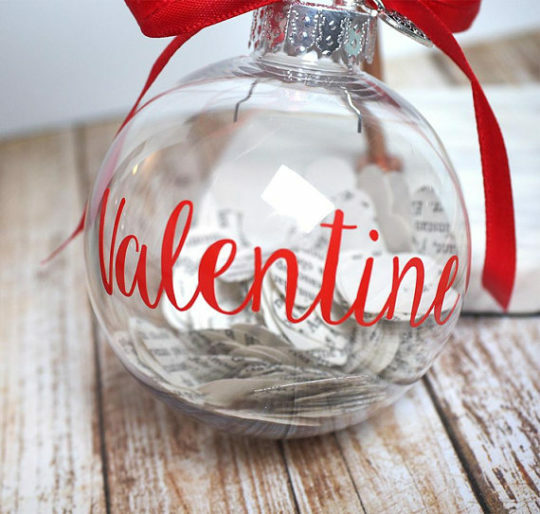 This handmade decorated bauble is filled with paper hearts cut from French-language romance books, which flutter as you shake it. The bubble measures 3.15 in (80 mm) and is made of tough shatterproof plastic, which is much safer than thin glass. It’s decorated with “Valentine” handwritten in red, and a heart charm on top. 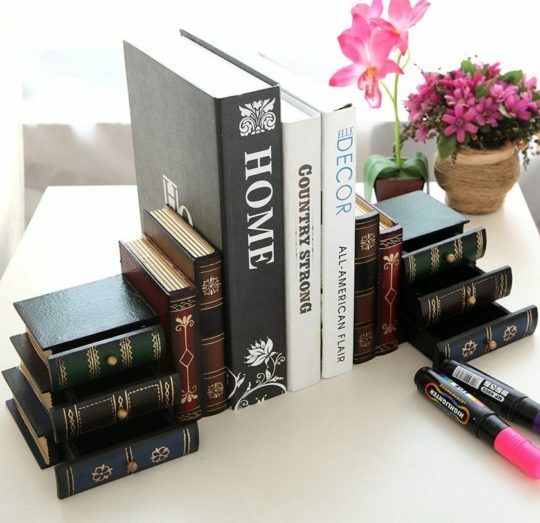 From MyGift comes a wonderfully-looking set of two wooden bookends that double as desktop organizers. Each one is designed to look like a stack of vintage books. Various colors of paint used on the front and sides simulate book spines and pages. The books stacked horizontally hide small drawers that you can use to store small items, such as jewelry or love letters. 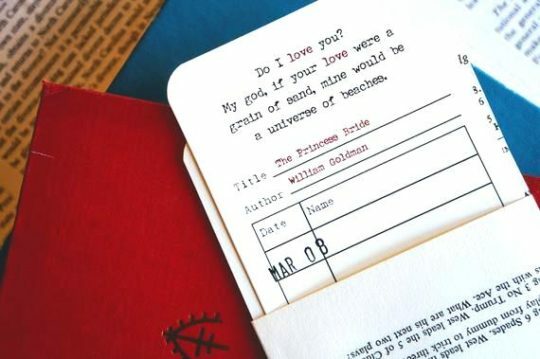 From Bookology Co. comes a literary valentine that features a literary quote from The Princess Bride by William Goldman, and is tucked inside of a library card pocket made from a vintage book page. You can order the card to be personalized with a stamped date of your choice, for instance Feb 14, or Mar 08. The card comes with an envelope that has been lined with a vintage book page. You can choose which quote you would like at checkout. Bookish jewelry is always among the best gift ideas for the Valentine’s Day. The only problem is which piece to choose from hundreds of designs available around the web. 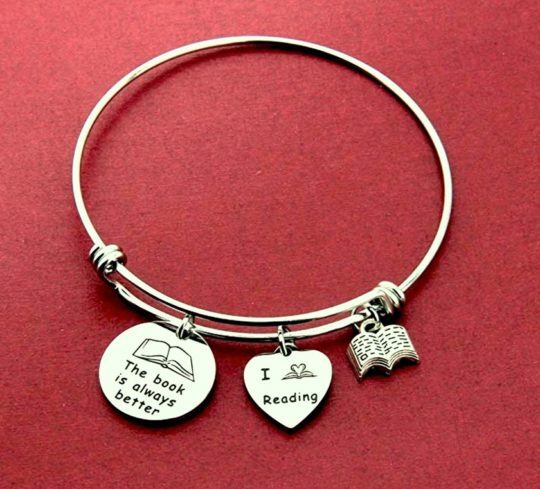 What about this cute bracelet featuring three bookish charms? It’s made of stainless steel, it eco and skin friendly, and is fully adjustable to fit a wrist between 6 and 8 inches. Valentine’s Day also becomes an important shopping event. Many online stores offers special promotions and deals. In the developing list shown below, you will find the most interesting Valentine’s Day 2019 deals. 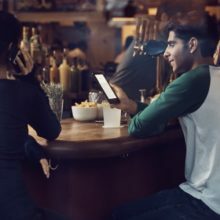 If you were waiting for a price cut on the newest Kindle Paperwhite, now is your chance to get it at a price reduced by 23%! The waterproof, Audible-ready Paperwhite 4 normally costs $129.99 (a variant with 8 GB of internal memory, and special offers). Its price has been reduced for Valentine’s Day 2019 by $30, to only $99.99. All variants of Kindle Paperwhite 4 are on sale right now. For the most expensive version with 32 GB, cellular connectivity, and no special offers, you will pay $209.99 instead of $249.99 (your saving is $40). The newly revealed deal is a great chance to bring Audible audiobooks to even more spaces in your home. Get the 2nd-generation Amazon Echo for $69.99 – this great-looking Alexa-enabled smart speaker is available in fashionable designs including fabrics and wood veneers. You can get the speaker right now for $69.99, which means you’ll save $30, as the regular price is $99.99. Save 50% on Echo Dot Kids Edition – the previous-generation Echo Dot addressed to kids features Alexa that has the voice of a kid-friendly DJ, comedian, and storyteller. The device comes in three bright colors and costs normally $69.99. Through Valentine’s Day 2019, you can grab it for half a price – only $34.99. On Sunday, February 10, you can dive into an exciting one-day Kindle deal and get for your Kindle or Kindle app a few new great reads. 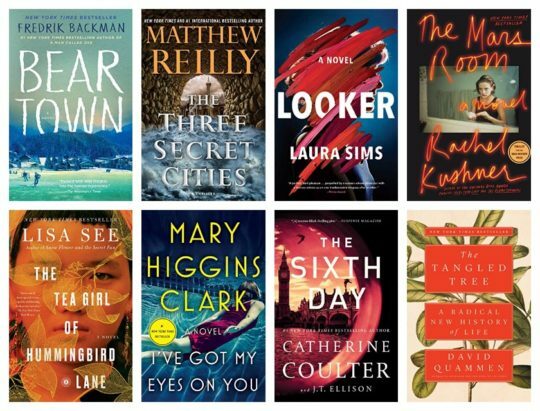 Over 20 bestsellers from Simon and Schuster Digital are discounted today to $4.99 each. This fixed deal price means that you can save even 80% on some of the featured books. Beartown by Fredrik Backman – the novel from the bestselling author of A Man Called Ove costs today $4.99 instead of $17, which means a 71% price cut. The Tea Girl of Hummingbird Lane by Lisa See – the saving is the same – 71% (the regular price is $16.99 ). The Mars Room by Rachel Kushner – this brilliant, empathetic finalist of the Man Booker Prize normally costs $27, so you save today as much as $22 (82%). The deal expires on February 10, at midnight. 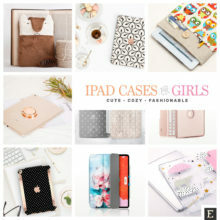 Where to buy Valentine’s Day gifts? 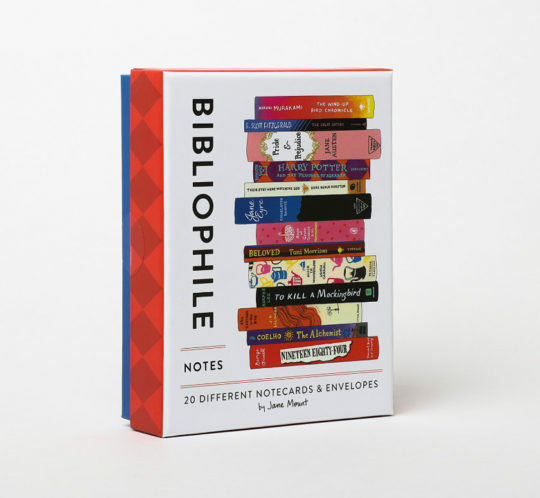 Make sure to explore our favorite online stores with the largest selection of bookish gifts. Amazon – every year, Amazon features hundreds of products in a special Valentine’s Day gift shop. You will find here gifts for her and him, as well as home decor. The most important benefit of Amazon is fast shipping – can shop for gifts even a few days before the 14th of February. Not on the High Street – the site is a favorite online destination for gift-seeking users from the UK. Find here great-looking inspiration for homemade gift ideas for your significant other. Zazzle – it’s one of the largest online destinations for gifts and accessories of all kinds. You can pick up artwork and choose the item you want it on. Most importantly, you can personalize almost every product: select the color, size, add own text and design elements. 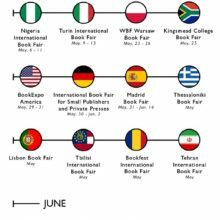 Literary Emporium – an online store dedicated to all kinds of literary gifts, one of the favorite destinations of book lovers around the world. You can find here clothing, jewelry, personal accessories, as well as stationary & prints. Etsy – visit Etsy, and you’ll immediately realize why it is the world’s favorite online destination for vintage and handmade goods. As most items are made to order, there are several ways to add a personal touch – also for the bookish items listed above.